Our last weekend of 2018 does not look too bad at all. Cold air will linger today but then we will warm up nicely for Saturday and Sunday. After that though, our next storm system arrives and will bring a chance for snow. For today, partly sunny skies will be above through the morning with some clearing possible in the afternoon. Overall conditions will be calm but chilly with highs only reaching the mid-20s. Tonight, cloud cover will decrease and temperatures will drop into the single digits. Saturday will offer up lots of sun along the Front Range with few clouds to intrude. Highs will top out right near the 40 degree mark. Saturday night into Sunday mostly clear skies will be above with lows into the upper teens. We close out the weekend on Sunday with a few clouds but should still manage to be mostly sunny. It will be the warmest day of the three day period with highs in the mid to upper 40s. Beyond that, our next storm system is set to arrive sometime Sunday night. With it, temperatures will drop again and we, with any luck, will see some measurable snow Sunday night into Monday. We once again received little more than a few snowflakes from yesterday’s passing storm. In its wake, cold temperatures will be in place with some breezy winds making it feel colder. Mostly sunny skies will be above throughout the day with increasing clouds late. Temperatures will only top out near the freezing mark. Cold, north winds will pick up speed around late morning and last until after dark. Tonight, cloud cover will increase and temperatures will drop with overnight lows around 10 degrees. Christmas week has seen many notable weather events which are forever emblazoned on Coloradans’ memories. The holidays of course seem to heighten these memories but the events themselves are no less significant. There was of course the infamous Christmas Eve Blizzard of 1982 and more recently in 2006, a storm hit just after the holiday that buried us in a blanket of white. In 1924…a prolonged cold spell occurred after mild temperatures during the first half of the month. Most low temperatures dipped below zero with the coldest reading of 15 degrees below zero occurring on the 24th. The high temperature of only 5 degrees on the 18th was a record low maximum for the date. In 1998…a vigorous cold front with north winds gusting as high as 38 mph at Denver International Airport on the 18th dropped temperatures from a high of 51 degrees to a low of just 6 degrees before midnight. The arctic air mass that settled over metro Denver produced intermittent light snow and a week-long protracted cold spell that caused low temperatures to plunge well below zero for 6 consecutive nights. The coldest temperature was 19 degrees below zero on the morning of the 22nd. High temperatures climbed only into the single digits on 4 consecutive days…from the 19th through the 22nd. At least 15 people…mostly homeless… Were treated for hypothermia at area hospitals. The bitter cold weather was responsible…either directly or indirectly… For at least 5 fatalities. Three of the victims died directly from exposure. The cold weather also caused intermittent power outages. Following the cold snap… Thawing water pipes cracked and burst in several homes and businesses…causing extensive damage. Only one temperature record was set. The high temperature of only 7 degrees on the 19th set a record low maximum for the date. In 1990…a surge of very cold arctic air invaded metro Denver. Many temperature records were broken as the mercury remained at or below zero for 85.5 hours at Stapleton International Airport…making it the third longest period of subzero readings in 118 years of record keeping. On the morning of the 22nd…the mercury plunged to 25 degrees below zero…which equaled the all-time record low temperature for the month set on December 24…1876. In the foothills southwest of Denver at tiny town…the mercury plunged to 33 degrees below zero on the morning of the 21st. On the same morning at Castle Rock the temperature dipped to 26 degrees below zero. During the period…other daily temperature records were set at Denver…including: record low maximum of 3 degrees below zero on the 20th and a record low of 17 degrees below zero on the 23rd. The record low was equaled with 16 degrees below zero on the 20th and 21 degrees below zero on the 21st. Snowfall totaled 2.7 inches at Stapleton International Airport from the 19th through the 21st. 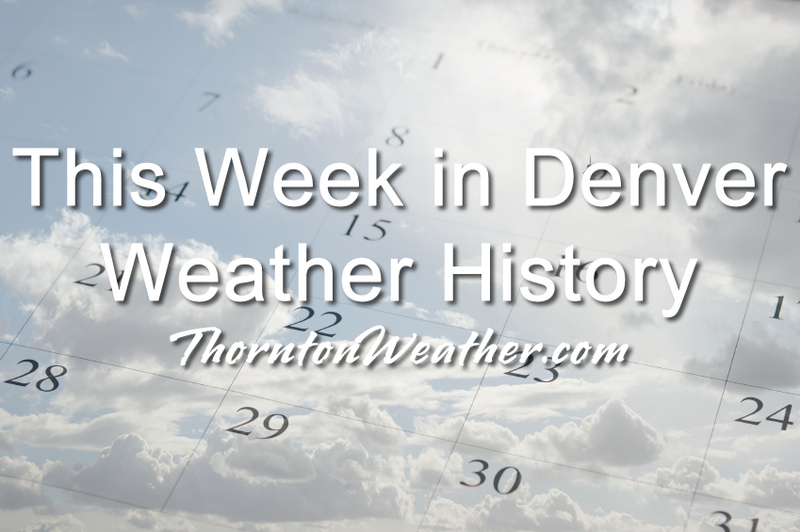 In 1918…light snowfall on each day totaled 12.0 inches over downtown Denver. Northeast winds were sustained to 16 mph on the 21st. In 1983…an extremely bitter cold spell occurred. The temperature remained below zero for 115 hours in Denver… The longest sub-zero period on record. The mercury dipped to 21 degrees below zero on the 21st…the coldest recorded temperature in over 20 years. The cold was accompanied by winds that plunged chill factors to 50 to 70 degrees below zero. Two people froze to death in Denver; both were found outside dead of exposure. Numerous cases of frostbite were reported. Hundreds of water pipes broke from the intense cold…water mains and natural gas lines also fractured…and electricity consumption reached record levels. Light snow totaling 5.8 inches fell at times…and holiday traffic was delayed at Stapleton International Airport for several hours. Eight daily temperature records were set at the time. The all-time record low maximum temperature for the month of 8 degrees below zero on the 21st still stands today. Other temperature records still standing include record low maximum temperatures of 5 degrees below zero on both the 22nd and 23rd and 4 degrees below zero on the 24th. In 1924…heavy snowfall totaled 7.9 inches over downtown Denver. During the storm north to northeast winds were sustained to 21 mph. Temperatures were quite cold…ranging from a high of 24 degrees on the 21st to a low of 5 degrees below zero on the 23rd. In 1964…high winds were recorded along the eastern foothills. A wind gust to 100 mph was registered at Jefferson County Airport near Broomfield. In Boulder… Where many thousands of dollars in damage occurred…warm Chinook winds gusted in excess of 45 mph downtown. A wind gust to 82 mph was recorded at the National Center for Atmospheric Research in Boulder. Heavy damage to power lines…homes…and roads was reported at Evergreen…Golden… And Boulder. Several people were injured by wind-caused accidents. West winds gusted to 53 mph on the 22nd and to 51 mph on the 23rd at Stapleton International Airport where some blowing dust occurred. The Chinook winds warmed temperatures in Denver to highs of 68 degrees on the 22nd and 71 degrees on the 23rd. In 1926…snow was heavy and totaled 6.7 inches in downtown Denver. Northeast winds were sustained to 17 mph with gusts to 18 mph on the 23rd. In 1979…heavy snow blanketed metro Denver. Total snowfall at Stapleton International Airport was 6.9 inches…and north winds gusted to 20 mph. Most of the snow…5.7 inches…fell on the 22nd. In 1984…strong Chinook winds howled along the Front Range foothills. At Table Mesa in southwest Boulder…gusts reached 108 mph on the morning of the 23rd. Gusts to 79 mph were clocked in Golden Gate Canyon. Gusts to 94 mph were reported in east Boulder. The winds flattened a two floor cinder block building under construction in Boulder… Causing 75 thousand dollars damage. Flying debris from the building slightly injured a policeman. A chain link fence was blown down. Dozens of windows and roofs were damaged in Boulder…along with mobile homes and cars. Numerous trees and power lines were downed. A giant plastic bubble dome was blown apart and collapsed…causing at least 100 thousand dollars damage. West winds gusted to 41 mph at Stapleton International Airport on the 23rd. In 2009…a winter storm produced moderate to heavy snow across parts of the Front Range and adjacent plains. In the foothills…storm totals included: 11.5 inches near Eldorado Springs…10 inches…3 miles southeast of Pinecliffe; 9 inches at Genesee…2 miles southwest of Golden and Ken Caryl; 8 inches…3 miles west of Jamestown and White Ranch Open Space; 7 inches…4 miles east- northeast of Nederland. Across the urban corridor and adjacent plains…storm totals included: 9 inches…2 miles west of Parker; 8 inches at Watkins; 7 inches…2 miles west-southwest of byers…12 miles southwest of Buckley AFB and 3 miles northeast of Parker. At Denver International Airport…6.1 inches of snowfall was observed. In 1915…apparent bora winds were sustained to 46 mph with gusts to 58 mph. Snowfall was only 0.8 inch in the city. In 1955…west-northwest winds gusted to 55 mph at Stapleton Airport. The downslope winds kept the low temperature from dipping below 50 degrees…the record highest minimum for the month. In 1969…a strong wind gust did 4 thousand dollars in damage just west of Broomfield. Minor injuries also occurred. In 1977…high winds occurred in Boulder with 90 mph recorded at several locations. A wind gust to 72 mph was reported at Lafayette. West winds gusted to 39 mph at Stapleton International Airport. In 1989…high winds were reported in the foothills west of Denver. At Rollinsville…a wind gust to 90 mph was measured. Northwest winds gusted to 44 mph at Stapleton International Airport. In 2007…high winds developed in and near the Front Range foothills of Boulder and Jefferson counties. Peak gusts included: 89 mph at the National Wind Technology Center; 88 mph atop Niwot Ridge; 83 mph…4 miles east- northeast of Bergen Park; 80 mph…3 miles southeast of Jamestown. At Denver International Airport…east of the surface trough…southeast winds gusted to 28 mph. The storm we had been hoping would bring some precipitation will arrive later today. However, it now appears to be headed too far south to do us much good. The day starts with mostly clear skies but we will see a quick increase in cloud cover this morning. Partly clear skies will be the rule for most of the day. Temperatures will be chilly with highs in the upper 30s. As the system passes, we will see wind speeds pick up by mid-afternoon and remain blustery through much of the night. As for snow, we may see some from about 1:00pm through 10:00pm with the best chances coming in the early evening. Minimal accumulation, if any, is expected. This system is proving to be a tough one to pin down though so with a bit of a shift in the track, we could see more. You’ll have no weather issues making it to your destination for the holiday meal today. We will have dry, calm conditions with temps near normal. We start out with a healthy bit of cloud cover. That will ease a bit leading to partly clear skies for the balance of the day. Temperatures will top out in the low to mid-40s. Overall conditions will be dry and calm. Tonight, skies will be mostly cloudy with lows to the low 20s. Monday will be day without any drama here in Thornton. Clouds will be easing and temps will be above normal. The day starts with a good bit of cloud cover but will slowly ease throughout the day. Overall conditions will be calm and dry. Temperatures will top out around 47 degrees, about 5 degrees above normal for the date. Tonight, Santa will not have any weather-related issues making his deliveries here on the Front Range. We will have a good bit of cloud cover though with lows to the low 20s. Looking ahead… Christmas Day looks to be dry and calm, like today, but with temps closer to normal. As for the Wednesday snow, we do think we will be seeing some of the white stuff but right now, it does not appear to be anything significant. That is still 48 hours away though so it could change. A little bit of a mixed bag of weather over the three day period as a disturbance moves through. We start out unseasonably warm on Friday then see cooler temps, perhaps a touch of snow Saturday, then rebound nicely Sunday. For today, high level moisture will bring some clouds but nothing too intrusive. Temperatures will be mild again with highs in the upper 50s. Tonight, partly cloudy skies will be above as the disturbance arrives. Some light snow may be possible in the pre-dawn hours through the first part of Saturday morning. Little to no accumulation is expected. By mid-morning Saturday we will see clearing skies and conditions stabilize. Temperatures will be chilly though with highs only around 40 degrees. Overnight Saturday into Sunday, mostly clear skies will be above with lows near 20 degrees. Sunday looks to be a relatively pleasant day. Mostly sunny skies will be above with highs in the mid to upper 40s. As we have been discussing the last couple of days, primary focus remains on a storm system that may impact us Christmas night and next Wednesday. The potential is there for a healthy shot of snow so if you are traveling for the holiday during that period, you will want to stay aware and continue to monitor the forecasts. A pleasant day ahead for us and a fine way to close out astronomical fall. Temperatures will be a good bit warmer than normal with lots of sun and calm conditions. The day starts with clear skies and there will be nary a cloud throughout the day. Winds will be light and out of the southwest, overall conditions calm. Temperatures will top out right near the 50 degree mark. Tonight, skies remain mostly clear with lows dipping to the mid-20s. Batten down the hatches because it is going to blow today. A strong jet will be approaching and while we will remain unseasonably warm, it is going to be coupled with a good dose of wind. The day starts out with mostly clear skies and we will see a few periods of clouds during the day but nothing overly intrusive. Temperatures will top out around 52 degrees, about 10 degrees above normal. As for the wind, it is already quite breezy early this morning and speeds will be increasing as the morning progresses. Look for them to peak around noon with gusts to 45 mph or so then gradually decrease in the afternoon. By this evening, we should again see calm conditions. Tonight, skies will be mostly clear with lows to the mid-20s. You can keep an eye on those wind speeds here. Astronomical winter arrives in Thornton Friday afternoon and with the solstice also comes the shortest day of the year. Winter officially begins at 3:23pm MST on Friday, December 21. The Winter Solstice occurs when the North Pole is tilted at its furthest from the sun – 23.5 degrees away. 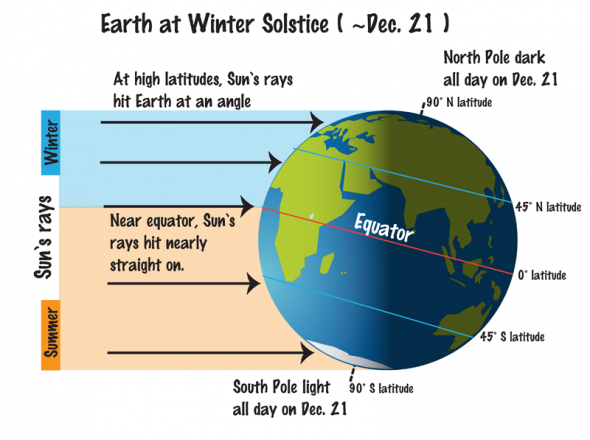 This results in the shortest day of the year in the Northern Hemisphere. Here in Denver, with sunrise at 7:17am and sunset at 4:38pm, our day Friday will be 9 hours, 21 minutes and 16 seconds long. The following day, Saturday, it will be one second longer and each day from now through to the Summer Solstice in June will get gradually longer as well. While we have a short day today, it is nothing like what will be experienced in the Arctic Circle. Areas north of there to the North Pole will have no direct sunlight at all. Conversely, areas south of the Antarctic Circle toward the South Pole will have 24 hours of daylight and have a midnight sun. Did you know that there is a difference between the astronomical seasons that we are discussing here and meteorological seasons? Meteorological seasons differ slightly and are geared toward matching the calendar with the annual temperature cycle. This is done primarily for meteorological observing and forecasting and in many ways it is more logical than the astronomical seasons. For the Northern Hemisphere, the meteorological spring covers the months of March, April and May. Summer brings the hottest months of the year and so meteorological summer is June, July and August. Meteorological fall then is September, October and November followed by the coldest months of December, January and February as meteorological winter.